Another weekend of NASCAR racing is underway, but last weekend's crash at Daytona remains on everyone's minds. Today, NASCAR officials said they are examining the placement of gates that separate the grandstands from the track. 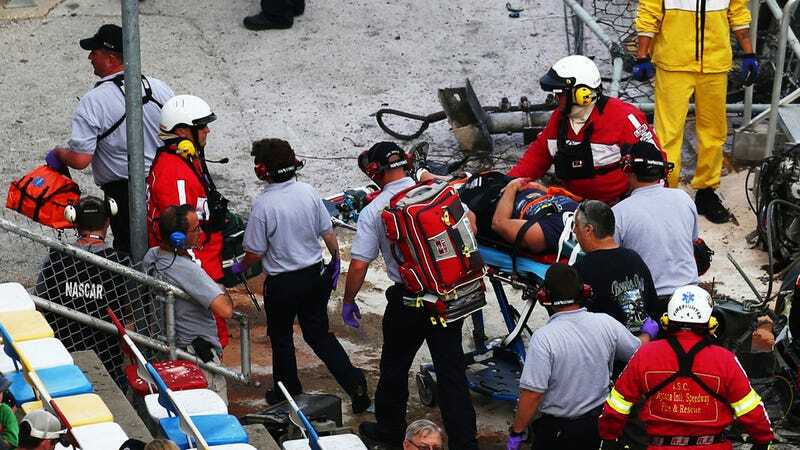 At last week's DRIVE4COPD 300 Nationwide Series race, driver Kyle Larson's car went airborne after a crash and debris went flying through that gate into the stands. More than 30 fans were injured, and some of them have already lawyered up. "I think because of where it came through and having pieces that did get through and it being a gate area, that's really going to be the focus for us to look at," Steve O'Donnell, NASCAR's Senior Vice President, Racing Operations said Saturday from Phoenix International Raceway. "We're certainly going to look at fencing in general, but I think that particular area, that it was a gate, did impact it. We know the gate was locked, but does that provide as much stability as the rest of the fencing we believed it did? We've now got to look at that impact." O'Donnell told the AP that two fans remain in the hospital. He also added that "most of the safety elements in that car did their job," noting that Larson walked away from the crash. The tethers held together as well, but the sections of the car they were attached to were sheared off in the wreck, sending debris flying. So there may be some safety changes on the horizon after the crash. What do you think NASCAR should do ?